If you stand in what will be the longest and deepest railway tunnel in the world – the new Gotthard Base Tunnel under the Swiss Alps – you feel a current of air on your cheek and a hum in your ears. Peer down the dimly lit hole into the distant future, and for a moment you think a train is coming. But the thought does not last long; after all, with trains scheduled to rocket through at 150mph, how could it? Once work on the 35-mile tunnel is complete, you will be able to hurtle in air-conditioned comfort from Zürich to Milan in just two hours 50 minutes – a saving of 50 minutes on the current travel time. Along the way, you can enjoy the novelty of burrowing 8,000 feet, or one-and-a-half vertical miles, below the surface of the earth – at double motorway speed limits. For now you can join a group tour of the tunnels. These are organised by the visitor centres, where you can see a model of the machine that did most of the work: a mechanical mole nearly 500 yards long, weighing more than 300 tons, and guzzling as much electricity as 4,000 family homes. In good conditions, it chewed through more than 125ft of rock a day. 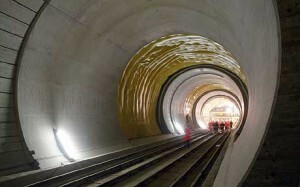 The tunnelling machines finished their work in March 2011, but engineers still have to complete installation of the track, power supply, and telecommunications equipment. The first trains are expected to thunder through towards the end of 2016 – 20 years after engineers dug the first shafts, and a year ahead of schedule. More remarkable still is the effect the project will have on the emotional map of the continent. The new railway route will be 25 miles shorter than the existing one, as well as much faster. Not only will the Alps shrink in significance as a barrier, but the Latin and Teutonic realms will find themselves within commuting distance of each other. Europe is being redefined. Which is why I had embarked on my journey. I wanted to explore a mountain barrier that has also been gateway between north and south for nearly a millennium. Starting deep underground and years in the future, I wanted to travel up and over this mass of rock as well as through the various tunnels that pierce it, threading backwards and forwards through a century and a half of railway history. The Gotthard massif has an additional resonance for me. When I was a child, we would cross it every summer on our way to visit family in the Italian-speaking south of Switzerland, where my mother grew up. We would drive over in our 1961 Volkswagen Caravette, and as we climbed over Gotthard, I imagined our dormobile had shrunk to take on a guest role in a giant train set. I had a similar sensation as I set off from the visitor centre at Erstfeld at the northern end of the Gotthard Base Tunnel, heading south on the existing railway route. At first the line climbs gently along the banks of the River Reuss. Soon the valley steepens, and to gain height the train throws a couple of balletic tricks. Beyond Gurtnellen, it disappears into the mountain to perform a dainty underground pirouette before re-emerging higher up; and near Wassen, it spirals into the mountain, and re-emerges pointing in the opposite direction, back down the valley – before repeating the move, tracing an elegant zig-zag up the mountainside. From our family Caravette, I would watch the trains as they played hide-and-seek with us. Now, from the vantage point of my train seat, I felt as though the whole outdoor train set were laying on a show. Three times the whitewashed, onion-domed church of Wassen glided past on its craggy outcrop: once high above, then level with us, heading in the opposite direction, and a third time far below. It was as if the scenery were giving encores – including once backwards, just to show off. The train finished its climb at Göschenen, where I alighted, before watching it vanish into the funereal gloom of the first Gotthard railway tunnel. This, too, was a pioneering feat of engineering in its time: drilled, dynamited and dug between 1872 and 1882, the nine-mile tunnel provided the first modern link between northern and southern Europe – and cost the lives of 199 labourers. To continue my climb on to the massif, I switched platform and boarded a train of the Matterhorn Gotthard Railway. The narrow-gauge cog train grinds up the wild and rocky Schöllenen Gorge, passing the giddying stone “Devil’s Bridge” atmospherically painted by JMW Turner 200 years ago. It was the construction of the first bridge here eight centuries ago that first made the Gotthard into an important Alpine crossing. Suddenly the walls of the gorge recede, and you emerge in a long, wide valley lined with high peaks, popular with hikers and cross-country skiers: the Urseren valley. Seconds later you pull into a small station, Andermatt, at the junction with another line running east-west. This historic town, with its pretty shingled houses and converted coaching inns, is a good place to get your bearings. Leading away from Andermatt are four great river valleys, echoing the cross on the Swiss flag. Follow the Rhône to the west, and you eventually reach Marseille and the Mediterranean; hike to the source of the Rhine just to the east and head downstream, and you would reach Rotterdam. 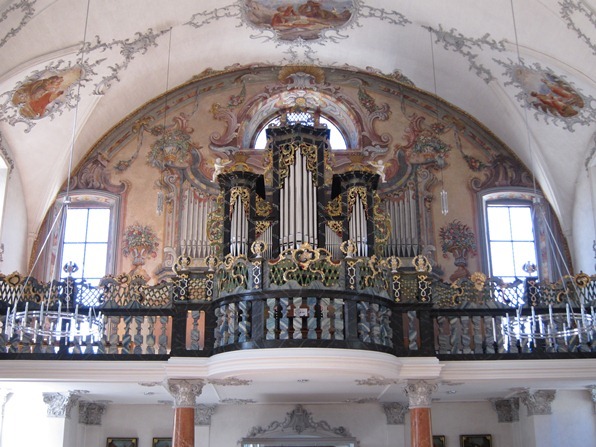 Leading north is the valley of the Reuss, which empties into the Rhine; flowing south is the Ticino – which gives its name to Switzerland’s only Italian-speaking canton – into the Po and finally the Adriatic. In each valley, a different language predominates. 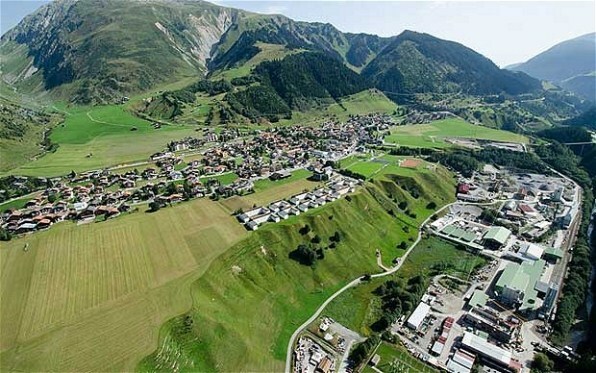 The Swiss to the west speak French, those to the south, Italian, and those to the north, German; while to the east live the 35,000-odd souls for whom Romansh, Switzerland’s fourth national language, is their first. The Gotthard massif is not just a barrier and a junction, then, but a watershed, physical and linguistic, at the heart of Europe: a manifestation in rock of the divisions that lie at the core of this continent, as well as a meeting-point of peoples, and the centre of gravity of this curious little country of four languages and cultures. It is also an intriguingly three-dimensional crossroads. Lowest of all is the new railway tunnel, at an altitude of about 1,800ft above sea level. The existing rail link is about 2,000ft higher – roughly level with the 10.5-mile motorway tunnel which, when it opened in 1980, was the longest road tunnel in the world. 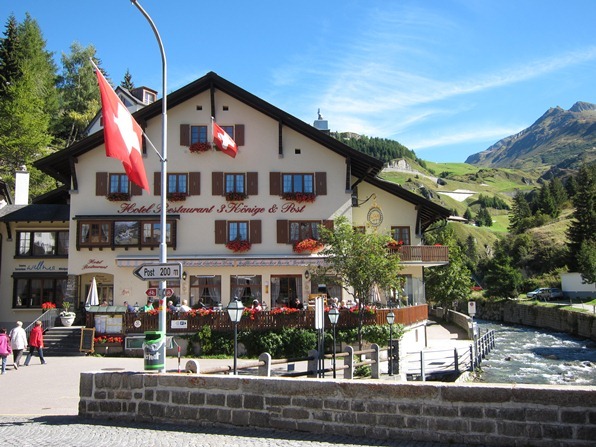 Another 1,000ft up floats the town of Andermatt, while the original road over the St. Gotthard Pass lies another 2,000ft higher still: a millennium of transport routes, laid under, through and over roughly a vertical mile of mountain that is as perforated as an Emmental cheese. Some of the tunnels in the massif were excavated by Switzerland’s army, for whom this was both a stronghold and line of defence. A former subterranean fortress has been restored and reopened last summer – home to the new Sasso San Gottardo exhibition, devoted to environmental, strategic and other themes relating to the Gotthard. My railway journey, by contrast, took me west up the Urseren Valley to Realp. A tunnel leading from here to the Rhone valley opened in 1981, providing the first year-round link between the two valleys. However, its opening spelt the death of the Furka line that from June to October every year carried passengers over the pass, 2,000 vertical feet higher up. Just two years after the new tunnel opened, railway enthusiasts formed an association dedicated to the resurrection of the summit line. Nine years later they reopened the first stretch, and 18 years after that – in August 2010 – they completed the final link, and were able to run trains on the full 11-mile route for the first time in a quarter of a century. At Realp I met one of the thousands of volunteers who have helped restore the line: Paul Güdel, retired owner of an electrical goods business in Lucerne. He showed me the railway’s workshops, and the line’s two prize steam locos, built in 1913 and sold to Vietnam in 1947 after the line was electrified. Enthusiasts traced them to a jungle depot where they had stood rusting since 1975, and in 1990 shipped them home and restored them. We boarded a waiting train and within seconds were puffing up towards the pass. As we climbed, Paul told me about some of the challenges the restoration team had faced. We soon reached one of them: the Steffenbach Bridge, which spans a ravine scoured every winter by avalanches powerful enough to sweep away everything in their path. The solution devised by the engineers who created the line was ingenious, and remains unique worldwide: a folding bridge that can be dismantled every autumn. The restorers retained the original design – but whereas in former days a team of 20 men needed eight hours to erect or fold away the 32-ton bridge, now a team of 10 can do the job in six hours, with the help of hydraulic winches. 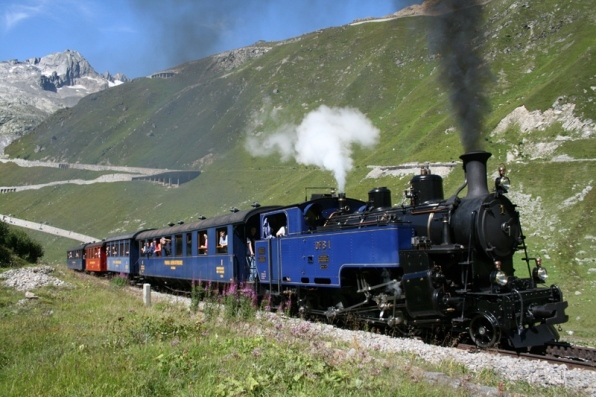 After about 45 minutes of climbing through the thin Alpine air, the wheezing loco had reached the highest point of the line: the Furka station, 7,100ft above sea level. We shut the windows for the smoky ride through the one-mile summit tunnel, before a long glide down into the Rhone valley – starting with a glimpse of the glacier that is the river’s source. At the village of Gletsch we embarked on the last sector to be reopened, with a renovated spiral tunnel through the rock and a steep descent through fragrant glades of pine. Just before we pulled in to the little station of Oberwald, where the old and new lines rejoin, Paul pointed out the ingenious new level crossing – automated so that the toothed rack disappears below the tarmac as soon as the train has passed. Not for the first time on this trip I had the impression that there’s nothing the Swiss like better than solving a challenge – especially if it involves mountains and trains. This seems equally true whether they are working with steam locos designed to crawl up mountains at 15mph or their electrically driven descendants hurtling underneath the Alps 10 times faster. I wondered what my great-grandfather would have made of all this. 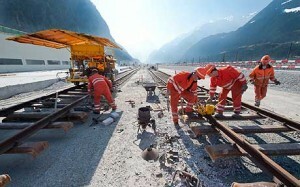 He, too, was a railway man, who helped build a branch running from the main Gotthard line to Locarno. He used to tell how the construction workers, when they were laying track through the marshes north of Lake Maggiore, would receive a daily tot of rum to ward off malaria. Three generations on, his successors are once again redefining the way the country sees itself. But by tunnelling under the great physical barrier at the heart of Europe, are they not undermining Switzerland’s raison d’être? After all, without the Alps, this quirky little country would not make sense. Perhaps. But I am more than happy for busy folk to rocket underneath the mountains, clear of the spectacular scenery that is the best reason for lingering in this part of the world. And I am delighted that the line will divert much of the freight that currently crosses the Alps at higher altitude, and so reduce pollution – the main reason for building the line in the first place. The mountains will be fresher and quieter as a result. I shall continue to catch the clanky old trains to get there, travelling at speeds with which my great-grandfather would have been familiar. And I like to think that, however far I travel from the childhood in which I first fell in love with this part of the world, I will never tire of playing with the world’s best train set. 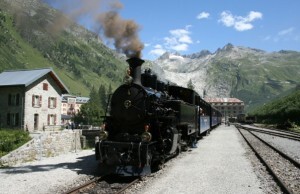 Rail Europe (0844 848 4070; www.raileurope.co.uk) sells through tickets to major Swiss cities. 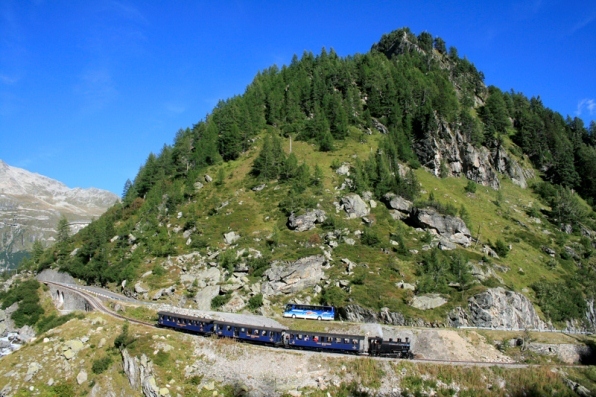 For travel within the country, the Swiss Travel System (www.swisstravelsystem.co.uk) offers a range of rail passes. For timetables – including connections with boats, buses, cable cars, etc. – see www.sbb.ch. For general tourist information, contact the Switzerland Travel Centre (00800 100 200 30; www.MySwitzerland.com). Admission to the three visitor centres of the Gotthard Base Tunnel (www.alptransit.ch) is free. A charge is made for site tours; reservations essential. Furka Cogwheel Steam Railway: www.dfb.ch; Sasso San Gottardo: www.sasso-sangottardo.ch. A combination of glorious scenery and a faultless railway system ensures that train journeys in Switzerland are invariably a pleasure. Here are some of my favourites: Full prices and timetable information – complete with details of connections with boats, buses and cog railways – can be found at www.sbb.ch. Prices given are for second class. The whole ride from Geneva airport towards the mountain resorts of the Valais fills me with happy anticipation. The most scenic stretch, perhaps, leads from Lausanne through the terraced vineyards of the Lavaux with their pretty winemaking villages – a World Heritage Site. The line then passes the medieval Château de Chillon, on the shores of Lake Geneva, before climbing up the Rhone valley, with ever more impressive Alpine views along the way. CHF 24 single, approx. 50 minutes (www.sbb.ch). The train climbs steeply from the palm-lined shores of Lake Geneva up to the chic mountain resorts of Chateau d’Oex and, across the border in German-speaking Switzerland, Gstaad. The route then leads down the lush valley of the Simmental before threading along the shores of six mountain lakes to historic Lucerne. CHF 73 single, approx. 5 hrs 20 min (www.goldenpass.ch). Less famous than the Glacier Express to Zermatt (www.glacierexpress.ch), this ride is nonetheless spectacular, incorporating the highest railway crossing in the Alps, at the foot of the glaciers of the Bernina massif. With the Albula Line from Chur to St. Moritz, all soaring viaducts and twisting tunnels, the Bernina line was declared a Unesco World Heritage Site in 2008. CHF 30 single, approx. 2 hours 30 min (www.rhb.ch). The steepest rack railway in the world carries you from the shores of Lake Lucerne up a vertical mile to the summit of Mt. Pilatus, and spectacular views, in just 30 minutes. But it’s worth spending at least half a day on the trip – and heading down the mountain on the other side, via a cable car and then a gondola. CHF 68 return, or CHF 97.20 for the “Golden Round Trip”, which completes the circuit with a boat ride on Lake Lucerne (www.pilatus.ch). A series of rail passes, available to non-residents only, offers total freedom – and good value. 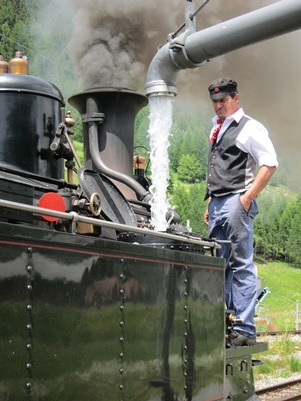 The Swiss Pass enables free travel on 12,500 miles of rail, boat and bus routes, as well as admission to 400 museums; from £185 for four days to £410 for one month. The Swiss Flexi Pass grants the same benefits on freely chosen days within a calendar month: from £177 for three days to £281 for six days. Two or more people travelling together at all times get a 15 per cent discount; children under 16 travel free when accompanied by at least one parent (020 7420 4900; www.stc.co.uk). 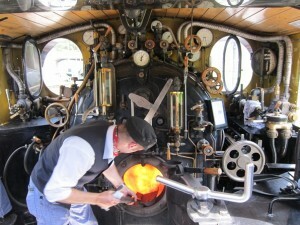 This entry was posted in Railway, Summer, Travel. Bookmark the permalink.